It is once again time for the Aspiring Metals Team blogroll and the topic chosen was Inspiration - what inspires us and where do we get our inspiration. Inspiration is such a fleeting thing. Sometimes, it is just a spark of an idea, which you have to battle out in your mind and on paper, until it takes on a complete and workable form. At others, a piece will come up in my mind, with all details and ready to be made at the bench. There are times when my imagination seems to be racing and ideas will spontaneously pop up at the oddest times. At others, nothing seems to happen. Since I want to make my living as an artist, the second situation is very worrying. I am actively trying to develop a consistent artistic vision (won't that sound good on my artist's statement?). I find that the more I work, sketch, look for unusual shapes and colours and go through life conscientiously, the more easily inspiration comes. If I slack off, then I can easily fall into a rut. A support network, where I can bounce ideas and get feedback, is also very important to me (like my wonderful team that inspired this post). Sitting down and making things help me focus and figure out what works and what doesn't. And, since I am an engineer, figuring out good proportions, interesting design rules and when to break them is also a constant challenge. For example, I was doing forging exercises to develop some hammering skills. The result was an interesting shape. I love long, thin pendants and my exercise piece was crying out to be used. By playing around with the shape, I was inspired by the flow of the metal to add a delicate blue green stone to highlight the liquid shape. The result was a gorgeous, elegant piece (in my humble opinion, of course). Each month the Aspiring Metals team chooses a topic and each write about that topic on their blog. This month we want to know what inspires you, and where do you look for inspiration? When my sister announced she was going to get married, I immediately offered to make the rings. It is, after all, what I do and making things for others is one of my ways of showing love and support. I was thrilled when both of them accepted. And so the fun began. The original plan quickly grew. Her fiance's aunt heard that I was planning to make their rings and wanted to contribute to the project. She sent a lovely old key chain, in an amazing shade of gold. My sister also wanted to incorporate a ring which our parents had given her for her 18th birthday, with a lovely diamond. And there was also a bit of new gold, which they had bought as an investment. My challenge was to incorporate all the elements into a beautiful pair of rings, which would also be a symbol of their union. Oh, dear. The first step was to prepare the metal. I melted the key chain and the ring, carefully poured into an ingot mold and laminated it down to a long strip measuring 1.6mm by 2.2mm wide. Since the mill is hand operated, my muscles got quite a nice workout. I also prepared some yellow gold wire, from the fresh investment gold. The metal was then cut and shaped into rings. I didn't want to solder them, since a wedding ring should be a perfect circle, with no beginning, no end and no weak spot, like a solder joint. The alternative was to fuse them together, by carefully heating them just up to the melting temperature, so the ends would melt together, but removing the heat before the whole ring collapsed into a shining puddle. 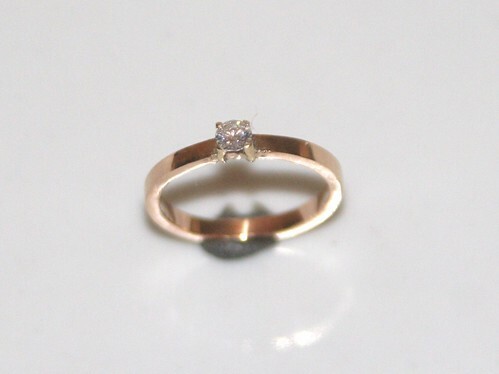 For the diamond ring, I also fused the wires for the prongs onto the shank. And, let me tell you all, I am not fusing prongs again! It is too nerve wrecking, since the prongs tend to melt before the shank is hot enough to fuse. 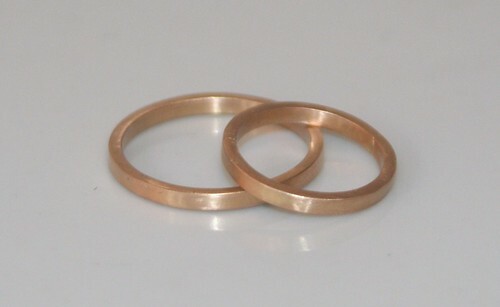 The rings were then carefully sanded and polished. Once the surface was perfect, I gave them a matte, brushed finished, which looks very elegant and modern. Here they are! Wedding rings without beginning or end. The gold represents the union of the two families, merged together by their marriage. From this, their own efforts shape their future, represented by the yellow gold, which is a fruit of their labor together. And everything is joined together seamlessly, supporting one another. While folks in the northern hemisphere are enjoying the last days of summer, the temperature is rising here in the south. And the humidity is going down. Way down - last week, we were down to 10% relative humidity, which is desert like (the World Health Organization recommends at least 60% for healthy living, so, yeah, very low). The warm sunshine had me craving something smooth, tart and icy. Frozen yogurt, as a matter of fact. But the freezer was bare and I didn't want to leave the house just for my treat. Deb Stoner, however, taught me well: "we are jewelers and we can do anything." So here is how this jeweler made creamy frozen yogurt. First, empty the only ice tray into a ziplock baggie (yes, the only one. Bachelorette living at its finest). Then, use your general duty hammer to bash it into smaller pieces. Mind you, don't use the mirror polished hammer. You never know what may mar it and it is nearly sacred in my studio. Now, put the crushed ice in a barrel, fill it 3/4 up with water and add salt. I am using barbecue salt crystals, because that is what I had on hand. It is great for salt casting as well, with all the textures. Throw in a small pot of yogurt too, since that is the main objective of this. To get creamy frozen yogurt or ice cream, it is important to churn it or stir it constantly as it freezes. Otherwise, you get a solid lump of frozen stuff and that is not good. Since I have no ice cream maker and I didn't really want to stir the yogurt constantly, I improvised: the tumbler. It is usually used to finish jewelry, by turning the barrel and pushing little steel balls against the silver, to strengthen and give it shine. Since it is slowly spinning around, it also works beautifully to churn my yogurt. Half an hour latter, here we have a perfect pot of frozen yogurt, perfect on a hot day. Note - rubber barrels don't really like ice and salt. Rinse it thoroughly before and after use and don't do this too often, otherwise the rubber may become dry and crack.